You should use MM2CT 0.24. First, we have to prepare directories structure for your city. It will make the work easier. Close program, first stage is over. You need textures for grass, roads, sidewalks, buldings, etc. They must be in TGA format (24bit or 32bit) and saved in _texture directory of your project, in this case D:\SampleCity\_texture. You can use textures from sample city with MM2CT. We are going to build a small city which contains: ambient traffic, police cars, a few roads, some offroad terain and two buildings. ATTENTION!! Roads and grounds can have only upper faces, bottom faces are NOT allowed. Remeber that outer vertices for roads and sidewalks must be higher than inner vertices. Next, we want to assign textures. For roads we need three textures (but we only assign then first one to the ROADS_ objects), intersections also require three but ground objects require only one material. Next, we are going to add some buildings. The buildings that MM2CT uses are all separate objects. like car, etc. You have to model them, map materials on them (you should also use UV Map) and name the high detail level object PH1_. Copy it and rename the copy to PB1_ (this will become the collision boundary of the building). We want to have an identical building in another position as well. We don't need to create it once again, we can just copy the object, move and rotate to the position we want. After that, we just name the new building PA1_ (This indicates an alias for the original building). You can have as many aliases as you want. Finally, we add some offroad terrain and name it GROUND_, apply a material to it, the same way as before. 1. Roads and ground are different objects (blocks), but they must be connected. 2. Border vertices from different blocks must be in the same position, so MM2CT can find it and mark these as perimeter points. 3. All objects except cops, should have assigned at least one material. 4. There could be problems with object scale, so use the sample city to check if it's too big/small. Type in a prefix, simple_city and click Make a city and AR archive. The prefix will be added to textures, objects and other files in your city and will make it less likely that your city will conflict with other MM2 mods. 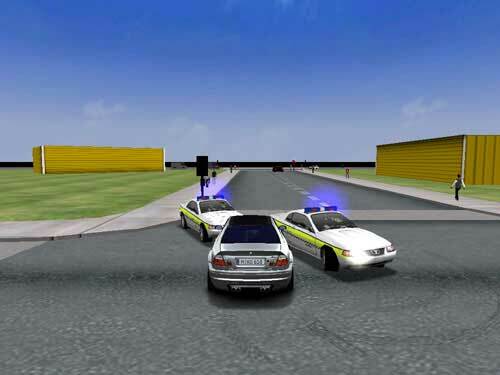 and save it as D:\SimpleCity\simplecity.3ds.cops. Then repeat .3ds importing process. 1. First of all, you can have many COPn objects (for example 4x COP1). 2. Please use more than one type of cop objects only if you want to have more than one type of the police cars (number means type). If you want to have the same cars in 5 different positions, just copy COP1_ object (COP1_0, COP1_1, COP1_2, etc) and in mapping file, put there COP1:vpcop. 3. The mapping file cannot be in city directory. It has to be in directory with .3ds file. MM2CT will then ask where you want to create the AR archive, select D:\Games\MM2\SimpleCity.ar, where D:\Games\MM2\ is the directory where you have installed MM2. Close MM2CT and run MM2. Go to the race meny, select your new city and go driving in roam mode. This small tutorial shows how the process of city creation looks like with MM2CT. It describes how to make a really simple city without any advanced structures, but it should be enough for understanding the process. Absolutely first-class! If this isn't enough to teach everyone, I don't know what is. Wow, you make it look so easy. Brilliant! fre_ber, perhaps an idea to sticky this? How do you add ambient traffic and/or civilians? Dude, traffic and civilians are automatically added when you name a road as ROADS_. Though be sure to have the outer vertices higher than the inner ones. though the author has done well... but he did not explain thoroughly. A Desperate Man, All Things Can! thanks mate to an insight into the complete chaos of map building!! also, how do you make one-way roads? and finally, i don't understand the sidewalks: it seems as though you only have one slanted face in 3dsmax, but in the game there's a corner.. is this automatic too? As far as I know, you can define the number of lanes in the .bai file (right Maxoff?). Yeah, I never got that thing either. When I make a slanted face, as instructed, it doesnot appear to be a sidewalk, it remains as it is; a slant. i don't understand the sidewalks: it seems as though you only have one slanted face in 3dsmax, but in the game there's a corner.. is this automatic too? Please post screenshots of the road from ZModeler or upload your .3ds, then I will be able to say more. I think that you should also create new topic for your problem, because this one is mainly for tutorial. Thanks alot for the Tutorial. I guess I'll give it a shot this summer once I get at least 2 or 3 cars working in MM2 (or dare I say MM1 as well? ), but at least I'm improving in ZModeler thanks to the help of the members here on the forum. Though just out of curiosity, has anyone ever made a city with moving bridges like in London (MM2) or Chicago (MM1) or made one with alternative cops (by using the name vpcop2 for example)?